Several types of grass grow in Texas. Bermuda and St. Augustine grasses are the most common, with St. Augustine growing in the warmest parts of the state, especially around the Gulf Coast. Buffalo grass is in the driest regions, and centipede grass is grown in southeastern and central Texas. Sow grass seed when the temperature is cooler to ensure strong root growth. Plant grass seed once the Texas climate has cooled down a bit. Spring or fall are perfect, after the last frost and before the first frost in the late fall. Aim for April or March for spring planting and late August to September for fall planting. Take the temperature of the soil. 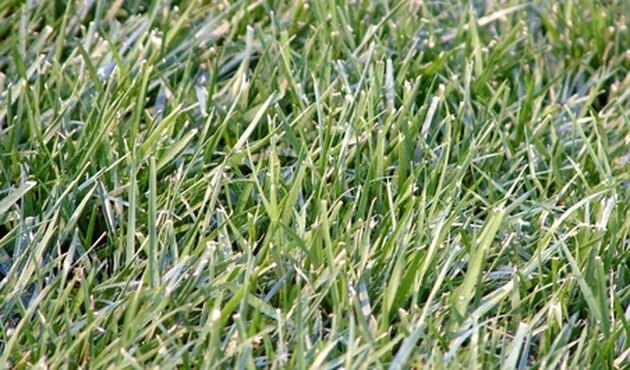 Warm-season grass grows best when planted in temperatures between 65 and 70 degrees F, whereas cool-season grass needs soil that is 50 to 65 degrees F. If planting in the fall, make sure to do so at least 60 days before the first frost. If you miss the planting window and you have mild winters, you can try to disperse it later in the fall. The seed will likely stay dormant through winter, then sprout in the spring. It's important to note, however, that snow and wind may move the seeds, creating a sparse lawn next year. When Is it Too Cold to Plant Grass Seeds? When Should I Plant Brome Grass Seed?